stickK was developed by Yale University economists Dean Karlan and Ian Ayres who tested the effectiveness of Commitment Contracts through extensive field research. Economic and behavioral research before Karlan and Ayres considered the effectiveness of the model, and their own testing found that people who put stakes (money or reputation) on the table are far more likely to achieve any goal they set for themselves. Taking out a commitment contract though doesn’t mean a thing unless there is a penalty for breaking the contract, and stickK covers that as well. Users can set up a contract to include payments to charities if they fail to meet their contracts, and friends can be used to make the final call on the result as well, reducing the chance that users will lie about the result of a contract. Steven D Levitt of Freakonomics fame wrote about stickK in January (Ayres is an occasional Freakonomics Blog guest blogger) and approved of the concept, a strong endorsement for the site. 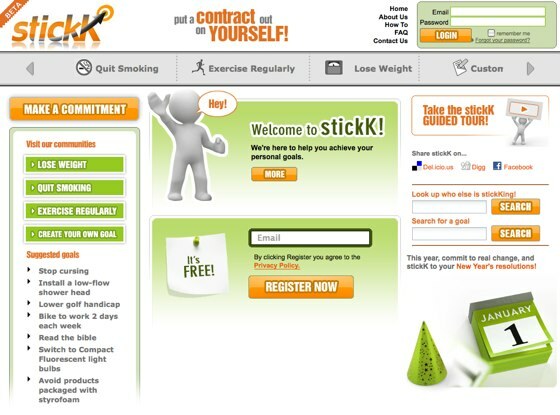 stickK has raised $1.2 million in angel funding and had over 1,000 commitment contracts as of early February.